The U.S. midterms are over. The Democrats now control the House of Representatives, the Republicans still control the Senate and recreational marijuana is now legal in Michigan. Michigan residents voted largely in favour to legalize recreational cannabis for anyone 21 years old or older in the state, while voters in Missouri and Utah both approved ballot measures to allow the sale of medical marijuana. The electoral results also appear to pave the way for Connecticut, Illinois, New York and Rhode Island to legalize cannabis in the future. Ontario isn’t the only province suffering a legal pot headache weeks after cannabis was legalized in Canada. The CBC is reporting that only five of the 51 recreational cannabis stores that were supposed to be open in Saskatchewan are selling legal weed in the prairie province. Meanwhile, 12 of New Brunswick’s government-run cannabis stores were closed this week due to an ongoing supply shortage. Cannabis users frustrated with the rollout of legal pot across the country still have access to black market online websites, which offer marijuana for as low as $3 a gram. 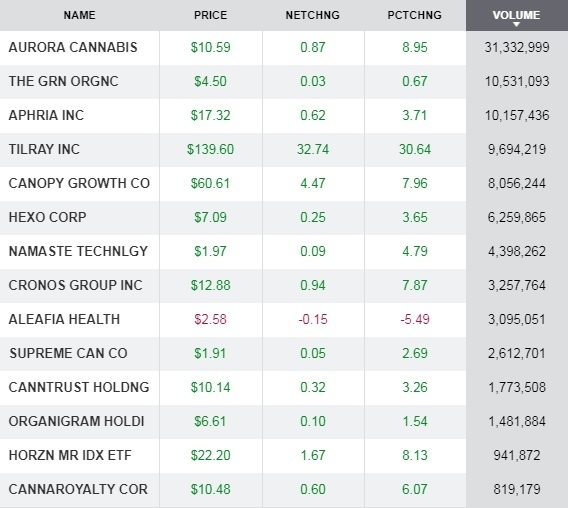 Financial institutions, mostly firms based in Canada, are making big investments for marijuana stocks traded in the U.S. Barron’s estimates that the Bank of Montreal is the most active bank, which has invested in total U.S.-traded marijuana stock investments valued at US$73.2 million based on filings made to the SEC, mostly in Canopy Growth and Tilray. CIBC Asset Management owned US$5.17 million in such securities, while U.S. Bancorp owned US$2.22 million.